What about Sonic items that have not been made yet? Or things that NEVER got made? It's time for prototypes & mock ups! 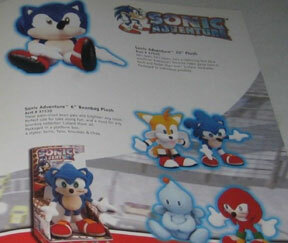 All the things on this page are Sonic items which are NOT yet released, or are items which were NEVER released. If something doesn't ever get produced, it'll stay here forever, for you to see and read about it. Also included on the page are 'mock ups' which are not real items. They're an illustration created by a company to show what a final item would look like. Sometimes they're Photoshops, others are combination of art and photos. A mock up never becomes real itself...but the item it illustrates is often made. When any item on this page DOES get made, (and SonicGear gets some kind of retail confirmation/fan photo) it will leave this page and move away onto the page it belongs on. Anything that does/is getting made should have release date info near it if it is available, along with the company which should be producing it--to help you find it! Here is a 'back to school' selection of things that didn't get made (that anyone's seen). It's labeled "boys" but really it should be "anyone" because there's nothing 'boy-specific' here. It has some ok ideas though, and some that are a bit odd. First, is an iphone case with classic Sonic Tails & Knuckles pixel art and squares, but in inexplicably says "game over" at the bottom. Why? Why does the soft-sides zip-top pencil pouch there say it as well? It's what you DON'T want to happen/be associated with because it's lame/bad skills to get a 'game over'. There's a spiral notebook with forward-facing Sonic & yellowish/blue squares that has the banner "Class of 1991 Notebook", which, would likely be cool for grade-school kids who weren't born in 1991/it was before them. The ruler & pencil also have the same theme. There's a fun lookin jacket/hood art, with patterned fabric interior & nice 'ready to run' Sonic in a triangle. 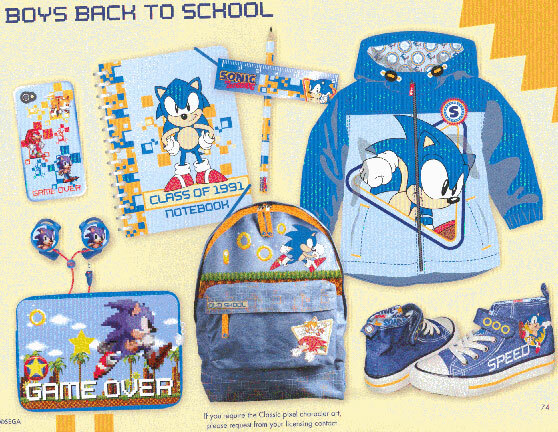 It also has a simple pair of 'waiting/annoyed' pixel Sonic on clip-over earbuds & a fun looking school bag backpack with classic design. It's quite different from the array of bags on School Supplies Gear, & the Tails & Knuckles airborne patch along with "old school" tab patch are a fun touch. Last is a pair of old-fashion solid-sole sneakers with laces & velcro strap for the top, with 3 rings. Sonic is on the outside, along with the word "Speed". Which items are real? The school bag, shoes & pencil are real, while everything else seems to just be mock up art. The jacket is the most obvious. Will any of this get made? With the success of the previous Sonic Jewelry items, also seen on Gear, (Class Ring, Shoe Pendant, etc) this new prototype photo of a planned necklace pendant appears. This seems to be called "The Chill Ring Pendant". It features a new pose for Sonic (others were based on stock art) who is reclining/hanging partially off of inside a brass-tone ring. The Sonic is stainless steel (as was most of the previous jewelry done), so he's a good contrast for the ring. The top, where it has the loop for the chain is a little gold-tone star bumper shape. This seems to have good design all around, from use of metal colors, to the star bumper and natural but different pose for Sonic. Hopefully this pendant releases when planned and the fan photos show it's just as good as this proto photo seems. This is a prototype Big the Cat plush. It was made by Tomy, but in the UK. (Tomy mostly operates in USA & UK, some of their stuff is dual-release) However, it was made FOR and to be released by Jazwares when they were getting into making plushes. Another jewelry item prototype appears, as the first wave continues to succeede. This one is a pendant, and appears to be called "Sonic Emerald Holding". It's a fully 3D figure in more of the stainless steel material & black patina they've used so far, but this time with the addition of a gemstone of some kind. (It is not labeled as an emerald, probably a green zircon) It's cut to resemble the famous green one out of the 7 chaos emeralds. You can see what they were going for. Triumphantly holding up a Chaos Emerald. But then, you can also see how it would NEVER work & look right. Sonic, by his very design/proportions can't ever reach that much above his head. Let alone to hold a large item like he must do here. If you watch his 3D animations (particularly breakdancing & such) you can literally watch the animators lengthen his limbs temporarily to get him to do moves. Like werehog style bungee limbs because his head is so gigantic & so are his feet. That's OK (ish) in animated media, but it really doesn't work when in permenent/non-moving form. Will this ever actually get released with his long, monkey-arms? Maybe. This is a part of a large photo taken at a meeting at "IDW". IDW is a comic book producing company, for lots of different brands. Archie gave up their Sonic comic book title / license in 2017, ending that particular comic's run. However, Sonic was deemed so popular that he SHOULD have a comic, even if it's not made by the original producer, Archie from the late 1990s when it got its start. IDW signed on to take over the task from Archie. The Gear Blog has more about what this is/why it happened. So, as a comic maker, of course IDW is happy to get another title, especially one as good as Sonic and it holds a meeting with a lot of employees at a typical big 'meeting table', with the Sonic logo in the background and all you'd expect. But, what you wouldn't expect, is that randomly some person in the meeting has brought a ReSaurus old (actually the first) "Big Figure" Sonic. He was their 'giant talking figure' (though only the base had SA1 sounds in it) What's even more interesting is that it's clearly a prototype of the figure, with no paint at all on the face or body. It reveals that the body is the 'dot color' with the blue painted on elsewhere, while the head is blue & had the beige added later. Of course the gloves were always white plastic, as they are separate pieces. Wow! Here are some real deal real cool prototypes to see! AND they're packaged for extra rarity! Just what were these for? The ReSaurus prototype Big & Gamma turn up again, this time in 2019, and for over $1,000 each on Ebay. Now, some new angles are provided, like the back of Big & the top of E102. 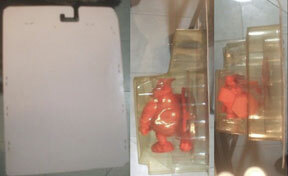 The top shows he's packed with that removable levitation-helper flat/device already mounted to the figure. The back of the box-mockup is (as thought) just a simple white cardboard card with staples holding on the bubble. It's prototype time with Toy Island! As the pages of their catalog are revealed to be full of things they never released. Dig in with some rare sights right here on Gear Prototypes. At leaft, above, are 3 plushes for Sonic, Tails & Knuckles. However, each of them was also supposed to talk! The description says they were to have at least 3 phrases 'from games', and would sell on those cardboard platforms you see the Sonic on. Each is over 10 inches tall. You can see they did a pretty nice job with these too, better than some of their figures, even. No detail is forgotten, though Knuckles' head is slightly off/big. This page shows the "Figures & Accessories". Here are some small things for your desk. 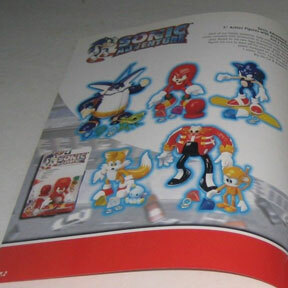 The right page has the eraser-shapes set, which is just colored 'eraser material' formed into fully 3D figures of characters (with cut-in lines for the details) You got all in 1 pack Big, Sonic, Knuckles, Tails & even a neutral Chao. The bottom 'crystal' looking figures are actually...glue! The tinted transparent 3D character toppers are full of clear school glue. They snap into the 'cap' bases. Funko is...trying to be at it again with POPS figures. 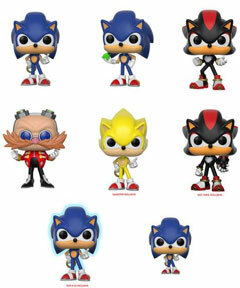 This is a CG proto page of Funko POP Sonic figures. And they're a bit frightful? The Sonic characters (except Eggman) were ALREADY exaggerated of proportion with big heads/mono eye, and cylindrical limbs, so POP-erizing them with even wierder proportions just makes it look...not so great. But the ideas they have here are actually ok.
Sonic finger waving, including Super Sonic, Emerald-holding Sonic and 2 ideas for Shadow...plus look! He's got a Dark Chao in his hand on the middle row. And, oddly the chao is actually correctly proportioned, which just throws the whole thing off more. The best figure here is Eggman because he started off with ordinary enough proportions so POP-erizing him yeilds an actual 'wacky chibi type' figure they're going for. The distorted mono-eye & black beady stares on the others just don't mesh. Will these actually be produced? Discovered by Taaron. Here's another look at the Toy Island catalog of some items that didn't get released. 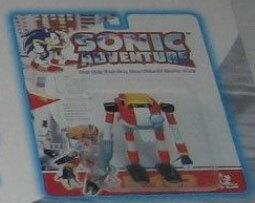 Its cover page has the SA1 pointing Sonic circle for the main graphic, along with the TI logo. The page shows the Gel Pens with figural character toppers that WERE released (though poorly & limited) as a boxed 6 pack. (This is in the SonicGear collection & is seen on USA School Supplies) Each ink color corresponded to the character topper. The other set has the same toppers (they were plasitc, fully 3D & painted) but on top of pencils instead. This is debateable if it was released or not. If the pens were, why not the pencils? Notice also that "The Girls Curse" starts here: the 6th topper in both instances is a Chao instead of Amy Rose who had a much bigger role in the game & would have given pink ink instead of 2 blue inks. Also somehow: Big.